My boys had no trouble picking out their Hallowe'en costumes this year. Aiden wanted to be a ghost. When I said, "You mean, like the bedsheet over the head kind of ghost?" he said yes, so the hardest part of his costume was getting my hands on a plain white bedsheet! I did come across the idea of attaching the sheet to a white hat so it wouldn't move around on his head, which I would never have thought of doing, but it worked perfectly. Zachary has taken up archery this year, so he wanted to be Robin Hood. I followed this tutorial to make the hat, which turned out perfectly and was so simple. I made his quiver out of a piece of poster board, rolled up and covered with brown flannel. The belt and sash are made of the same flannel. 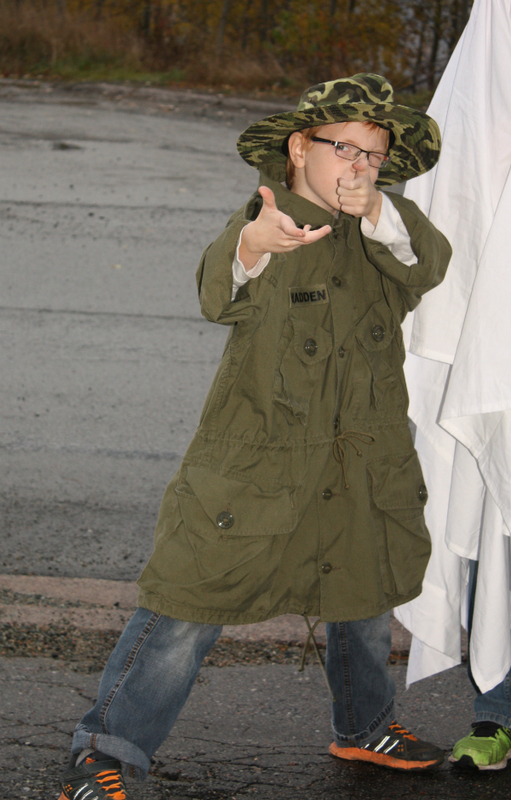 Nathan decided he wanted to be an army man. His coat is a little too big for him, but it's genuine army issue thanks to my uncle who gave it to us when he retired from the army. And, of course, Nathan had to get into character! 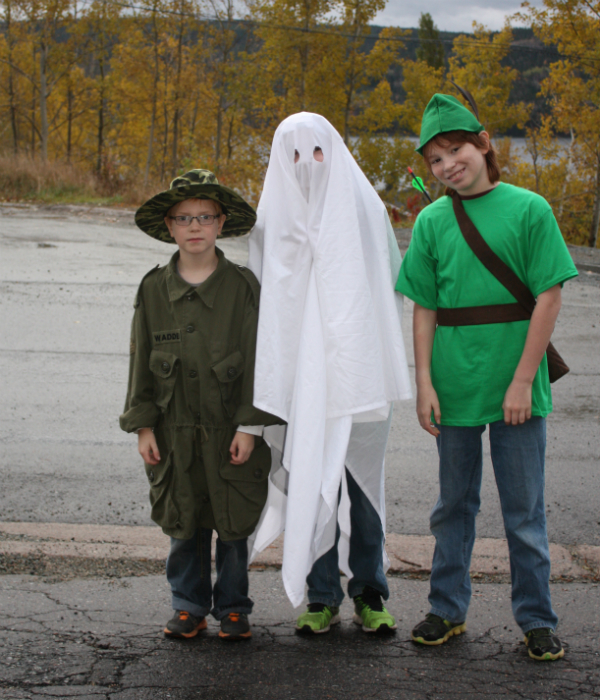 The ghost, Robin Hood and the army man are all out trick-or-treating now, and when they get home our treat drawer will be filled to capacity for a while! One morning last week I was tidying up the kitchen while the boys I babysit were playing with blocks and trucks on the kitchen floor. I finished my tidying and they were still content playing, so I picked up my phone and sat on the floor to check Instagram. Only a moment passed before the 1 year old noticed that I was sitting down and he immediately picked up a book that was on the floor, came over and plopped himself down in my lap. At the time, I didn't think much of it. I just reached up to put my phone back on the counter and started reading the book. It's not like this is an unusual occurrence after all. I often have one or the other of them sitting on my lap, either with a book or just for a snuggle or a round of Pat-a-Cake. It was only later that I started thinking about how this little guy just assumes he can sit in my lap. There's no question in his mind that he is welcome to sit on me, or to take my hand and drag me over to whatever it is he wants to show me. Not only does he assume that he can do those things, I'm pretty sure he assumes I want him to do those things. That I want to give him my attention, and really, that there's nothing I'd rather do. Adults aren't like that. We worry about whether or not people like us. We worry that we're bothering people if we need to ask them for help, or if we need their attention for a moment. If the other person is someone we consider to be above us in some way, then we worry about whether or not we're worthy of that person's time. One year olds have none of those issues. There's a story in the Bible about parents who were bringing their little children to Jesus, hoping that He would bless them. Jesus' disciples started to shoo them away, rebuking the parents for trying to waste Jesus' time. Jesus saw what was happening and He got angry too, but not with the parents. To His disciples, He said, "Let the little children come to me, and do not hinder them, for the kingdom of God belongs to such as these" (Mark 10:14). I've always seen this incident used to explain to children that no matter how young they are, they matter to God. I've never thought about it as anything beyond that. But last week, I remembered the next thing He said. I imagine he turned so that His words were addressed to everyone, not just to His disciples, as He said, "Truly I tell you, anyone who will not receive the kingdom of God like a little child will never enter it" (v. 15). Think about that for a moment, and think about how a 1 year old would approach God. If God were physically in the room, there's no doubt in my mind that every child around would be trying to climb into His lap. Would the adults? Or would we be too worried about that thing we said last week, or too busy thinking that God would probably rather spend time with so-and-so than with us? Or would we be convinced that God's not really interested in what we have to say, so we shouldn't bother Him? The insecurities that complicate our relationships with other people are magnified when it comes to our relationship with God, aren't they? The truth is, while God isn't physically in the room with me as I type this, or with you as you read it, He is in the room. He's always in the room. And He wants us to come to Him. If we have Jesus, then we are welcome. It's as simple as that. Our insecurities come from how we view ourselves and have nothing to do with how God sees us. Like a 1 year old, we can assume that we are welcome to approach God. Not only that, we can know that there's nothing He wants more than for us to come. Having that relationship with us is why He sent Jesus, after all. It's that time of year again, when the quilting industry professionals head to Quilt Market, and we quilt bloggers link up to Amy's Creative Side for the Blogger's Quilt Festival. It's always fun to see all the amazing quilts that have been made since the last Blogger's Quilt Festival...and don't forget there are prizes up for grabs too! Usually I have to pick and choose which two quilts I'll link up for the festival, but this time around there's not much debate. I only have one finished quilt! I'm entering my Friendship Galaxy baby quilt in the Original Design category. The pattern for this quilt is out with testers, some of whom have already finished their versions, and I can't wait to show you what they've made. 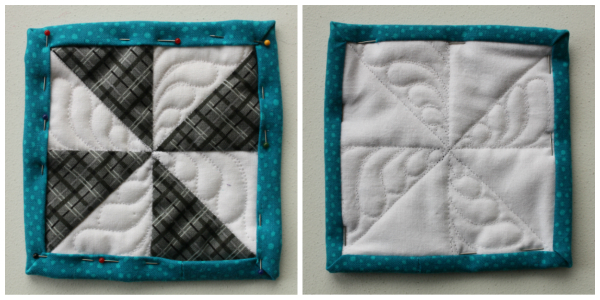 The pattern includes the baby quilt size, plus two mini quilts and a throw size. I'm hoping to release it early in November, so be sure to check back! Many thanks to Amy for all the work she puts into organizing the Blogger's Quilt Festival, and to her generous sponsors who donate all the prizes. 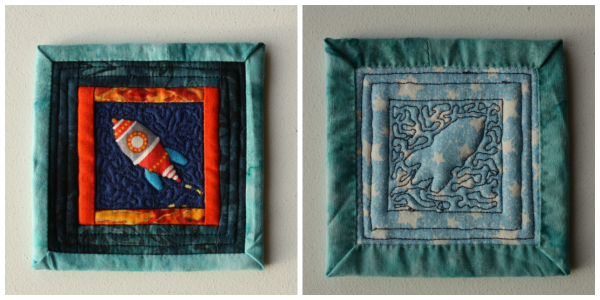 Be sure to check out Amy's Creative Side to see all the quilts entered in the Festival. There are sure to be a lot of wonderful creations! I have a little of this and a little of that to share with you today. 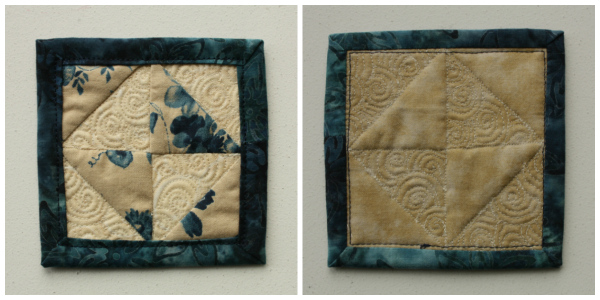 Right now all the quilting I'm doing is secret, so there's not a whole lot I can blog about yet. I can show you this little snippet of the fun I'm having though! I love how well quilting shows up on solid fabric! 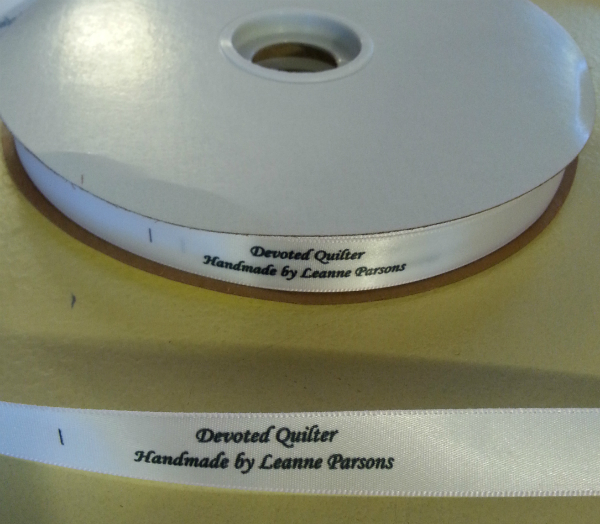 A while back I won a giveaway on My Quilt Infatuation, for 1000 custom printed quilt labels from Finer Ribbon. The roll of labels arrived today and I love them! Have you seen the release of The Quilter's Planner, designed by Stephanie of Late Night Quilter? This looks like a gorgeous tool for keeping all parts of your life organized, including your quilting projects and plans. There are pages for doodling, pages for keeping track of WIPs and pages of graph paper for when you need to sketch out a new block or quilt. 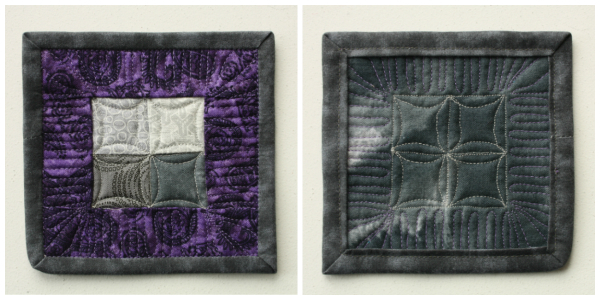 Plus, there are quilt patterns included, and a quilt block for every week (including one of mine!). For a peek into the planner, and to order a copy, visit Stephanie's blog. I can remember being in school and being confused, but not wanting to ask a question because I didn't want to look stupid. Did you ever do that? Sit there not understanding what the teacher was saying, but still you kept your mouth shut because you figured everyone else understood perfectly? I can also remember that sometimes, usually at the start of a new school year, a teacher would stand at the front of the class and say, "There are no stupid questions" and "If you don't understand, there are probably others who don't understand either, so ask me to explain it again." Funny thing is, even with that assurance that I probably wasn't the only one feeling confused, I still found it hard to raise my hand and say I didn't understand. Apparently I'm not the only one who didn't want to ask questions when things got confusing. Even Jesus' disciples avoided asking questions. "He [Jesus] said to them, 'The Son of Man is going to be delivered into the hands of men. They will kill him, and after three days he will rise.' But they did not understand what he meant and were afraid to ask him about it" (Mark 9: 31,32). Just imagine yourselves in that situation for a moment. You are with Jesus, your trusted teacher, and your fellow disciples. The Bible even says there was no one else around, since "Jesus did not want anyone to know where they were, because he was teaching his disciples" (vv. 30, 31). It's about as safe an environment as can possibly be imagined. Then Jesus tells you something that makes no sense and, even though He has told you the same thing before, you can't bring yourself to ask what He's talking about! I wonder why the disciples were afraid to ask Him. Were they like me, sure that everyone else understood, so they didn't want to expose their own confusion? Or did they not really want to know what Jesus meant by the 'they will kill him" portion of what He said? I mean, sometimes if something is scary, it feels easier to just pretend it doesn't exist. Or was it the "and after three days he will rise" portion that made them afraid? That concept isn't an easy one to understand, so maybe they just didn't want to go there. Whatever the reason, the disciples didn't ask Jesus to give them more information, or to explain Himself again so they could understand. God isn't afraid of our questions. Read through the Psalms sometime and see how often David questioned God. For example, Psalm 10 starts off with, "Why, Lord, do you stand far off? Why do you hide yourself in times of trouble?" That's a harsh question, almost an accusation, isn't it? And yet God was not bothered by David asking it. In fact, God says of David, "I have found David son of Jesse, a man after my own heart" (Acts 13:22). God wants us to ask our questions. We may not always get answers. David didn't always get answers either. But God wants us to ask, He wants us to care enough to want to understand. He doesn't want us afraid of looking stupid. In fact, James tells us that if we lack wisdom, we should be all the more eager to ask God! "If any of you lacks wisdom, you should ask God, who gives generously to all without finding fault, and it will be given to you" (James 1:5). So, my question for you is this: What questions are you afraid to ask? So much for sticking to the things I need to be doing! 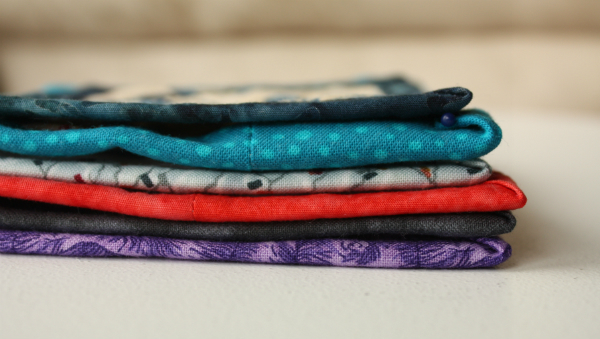 I got sucked back into the mini mini quilt swap last weekend and made 6 more teeny little quilts. It's just so hard to resist taking on more swaps! I did, however, manage to finish the quilt top for my next project before starting these, so I haven't completely abandoned my FAL list for this quarter. These were just as much fun to make as my first mini minis, and just as satisfying to finish so quickly! Most of these mini minis were made with units I already had in my scraps. This beige and blue one was made out of four little HSTs. So was this coral and aqua one. I really love how bright and cheerful this one is. And I couldn't resist making a pinwheel out of these leftover HSTs. Pinwheels have always been among my favourite blocks. Unfortunately, I picked this binding without first checking to be sure I had a thread to match it, so this one is still just pinned together. I'm swapping it with Heather, of QA Creations, though, and she's not quite ready to swap yet so I have time to get the right thread. 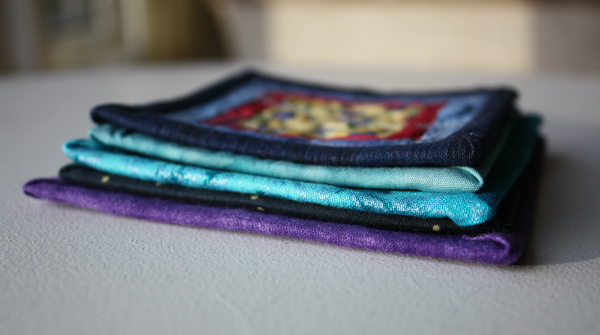 Also, it's hard to quilt these tiny spaces without losing some of the design under the binding. I need to practice more, I guess! These next few mini minis were made from little 4-patch units. 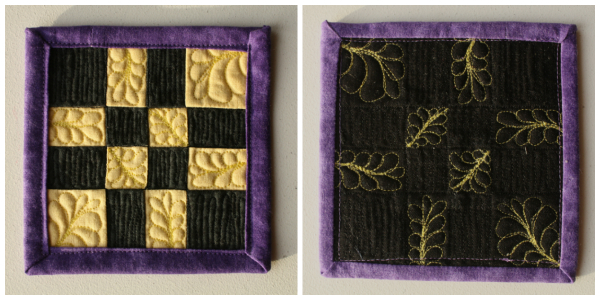 It was fun figuring out how to quilt in the border around each one. Now, once again, I'm going to stick to bigger projects for a little while. No telling how long that will last, though! Last quarter I set what I thought was a reasonable list of goals, with only three projects, all of which I expected to finish. Ha! Two of those projects will be making an appearance on this list as well. So, since a reasonable list didn't actually mean I finished everything I set out to finish, I figure this time around I may as well make an unreasonable list and hope for the best. I almost can't do worse than I did in Quarter 3! Yep, again. I love this quilt, but I keep leaving it to work on other projects that can be finished more quickly. Yes, I realize that if I stopped leaving this one it would be finished much more quickly than it will be if I keep leaving it to do other things, but I've never claimed to be overly logical. However, progress has been made! 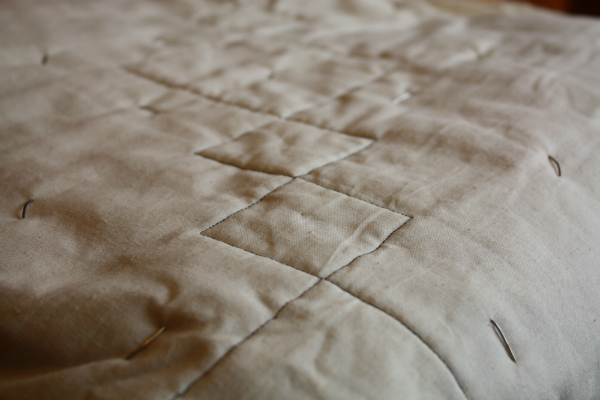 At the start of Quarter 3 I was still working on the straight-line quilting, which is now finished. I have divided the fmq into three sections based on the colours I'll be working in. One of those sections is now finished and the second is well underway. I have a plan for the third, which is actually the bulk of the quilt, and I hope to be working on that section before the week is out. 2. The Skinny Mini Friendship Galaxy quilt made out of the test blocks I made while drafting the pattern for the baby quilt. That baby quilt was my only finish last quarter and, interestingly enough, was also the only project not actually started when I made my list! I have cut the backing for the Skinny Mini, so I wouldn't accidentally use it for something else, but that's as far as I got. 3. The annual cross-stitched Christmas ornaments for the boys. I know what I want to make for two of the three boys, so I need to figure out the third and then actually spend the time stitching and get it done. 4. A project for Make Modern magazine. This one has a rather firm deadline of November 15th, so it will be on the list of finishes for sure. The top is finished so I need to make a backing, then get it quilted and bound, then write up the pattern. 5. A new Flower Box quilt. Well, try as I might, that's all the current projects I can think of right now, so I guess that's all I can put on my list. Let's see how I do this quarter! Happy Thanksgiving Day (for Canadians, at least)! There will be turkey and all the fixings on my table this evening, followed by a delicious homemade Apple-Cheese Danish for dessert. We've been looking forward to this meal for days! Last night Aiden said, "Turkey dinner tomorrow, woo hoo!" I love that my boys are so easy to please :) While we eat, we'll ask the traditional "What are you thankful for?" - the answers to which are sometimes funny and always interesting. I know that living where I do means I have a lot to be thankful for, from the big things like peace and freedom, to the little things like leaves changing colour and the ocean visible from my living room window. The same is probably true for you, too. Sometimes, though, circumstances get in the way and we get caught up in what is going wrong, so much so that we lose sight of the good things in our lives. Do you ever find that happens to you? 1 Thessalonians 5:18 says "give thanks in all circumstances; for this is God’s will for you in Christ Jesus." Notice Paul didn't tell the people of Thessalonica to give thanks for all of their circumstances, but to give thanks in all their circumstances. Here's an example of the difference: when I was sick a couple of weekends ago, I spent pretty much the entire weekend sitting in one chair because I was too exhausted to do any of the many things I wanted or needed to be doing. It felt like the weekend was completely wasted because I didn't get anything done. I was not thankful for my circumstance (being sick), but I was thankful for a husband who went to buy me medicine without needing to be asked and who stepped in to get meals on the table, which is usually my responsibility. I was thankful for the book I read and for the the little bits of hand stitching I was able to do. Likewise, when my washer broke and we ended up waiting two weeks for a new one, I wasn't thankful for the broken washer, but I sure was thankful for friends who shared their working washers with me! It's not always easy to find things to be thankful for, especially when our bad circumstances are more serious than a common cold or a broken appliance. So why is it God's will that we give thanks in all our circumstances? Why does He want us searching for the good amid the bad? I think it has to do with perspective. If we're focused on the things that are going wrong, it can feel overwhelming, and it can feel like things will never get better. But our perspective changes when we start to think about the things that we can be thankful for. It lifts our spirits a little, and helps us to feel hopeful and less overwhelmed. Even better than that, being thankful reminds us that we have Someone to thank. God cares about us, no matter how we may feel while in the midst of unfortunate circumstances. By focusing on the good in our lives, no matter how puny the good may seem in the face of sickness or loss or whatever is going on, by seeing the good, we are reminded that "Every good and perfect gift is from above, coming down from the Father of the heavenly lights, who does not change like shifting shadows" (James 1:17). A heart that is thankful is also less likely to become bitter. We have all known people who have allowed the circumstances of their lives to make them bitter and they are not pleasant people to be around. Neither are they happy. Even when their circumstances change for the better, people who have become bitter tend to cling to their unhappiness. God does not want that for His people, and so we are instructed to be thankful, no matter what the circumstances. Since it is God's will for us that we be thankful in all circumstances, let's allow today to be a day of thanksgiving (even if you're not Canadian!). In fact, let's allow every day to be a day of thanksgiving. So tell me, what are you thankful for? I've been a little distracted lately by some little projects. 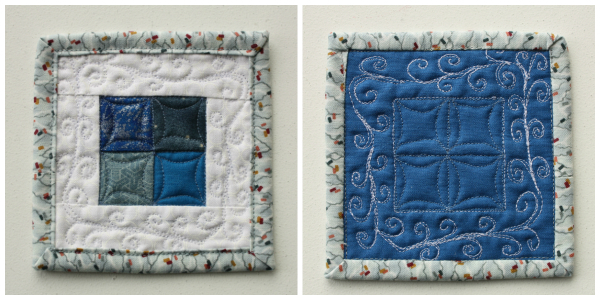 I tried to resist the Mini Mini Quilt Swap on Instagram. Really, I did. But the cuteness of the little tiny quilts I kept seeing was just too much to resist for long. 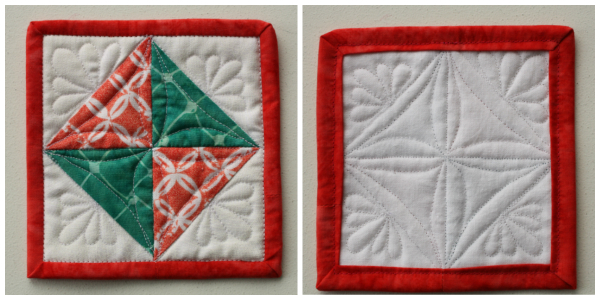 This is a low-key swap where you just offer to swap with someone and then you both make mini mini quilts that finish in the vicinity of 4". 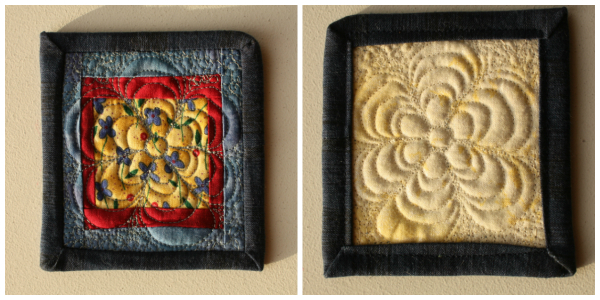 Like I said, tiny quilts! 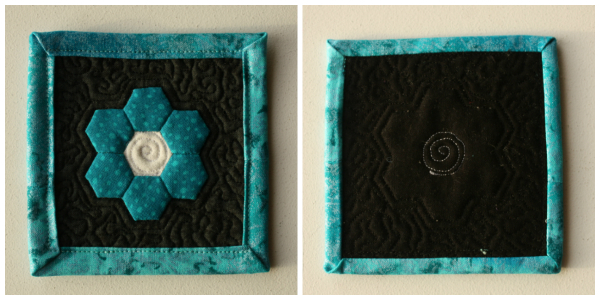 My very first thought was to make a tiny hexie flower and applique it to a background square. Ever since I saw the quilts made with the Flowers for Eleni, I've wanted to make something similar. It was fun to finally do it, but making this little quilt only makes me want to make a bigger version! The hexies for this flower were 1/2" on a side. This one has been sent to Erin, @lemonadefish on IG. Then I wanted to try a Disappearing 4-patch, but I found the effect was a little lost at this small size. 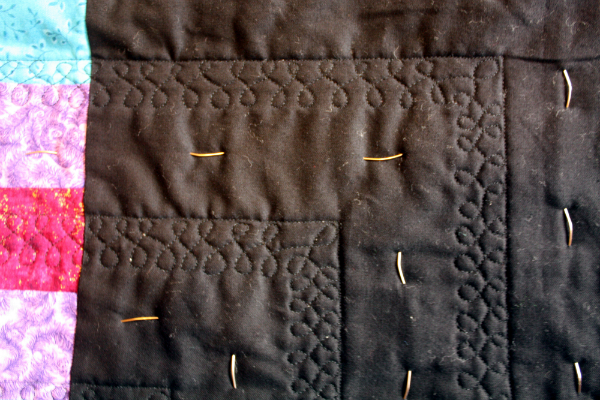 The quilting was fun though...teeny tiny feathers and some organic switchbacks finished it off quite nicely. This one is still available to swap, if anyone is interested. I had seen a few whole cloth mini minis, so I wanted to give one of those a try too. 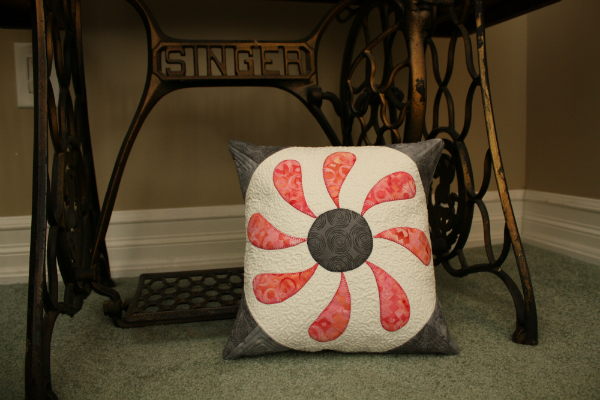 I thought it would be fun to make a pinwheel using two different colours of thread, and two different quilting patterns. I don't usually use thread that contrasts so much, but I really liked the effect for this little project. And I found that even though each individual pebble isn't perfect, the overall effect is nice. I really liked how the pink thread pops against the dark grey fabric I used for the backing. I have sent this one to Jayne, @twiggyandopal on IG. 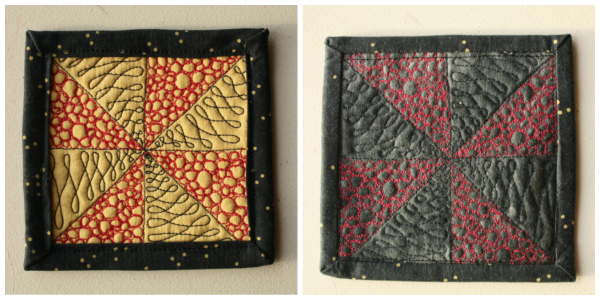 The really fun part was that I quilted all three of these mini minis in one evening! I've never completely quilted three quilts in one evening before!! 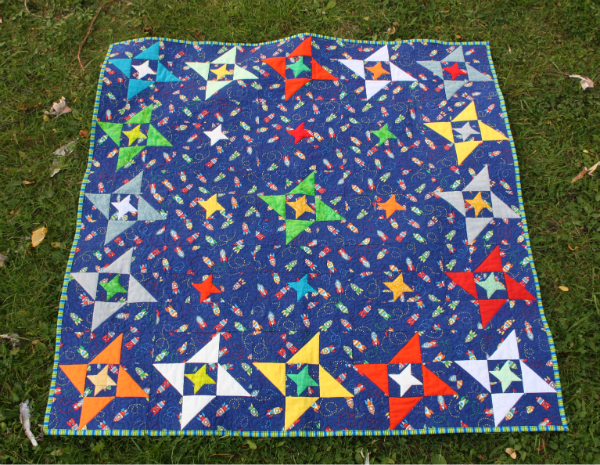 The next mini mini quilt started with a scrap of the rocket fabric from the Friendship Galaxy baby quilt. This quilt is for Yvonne, who blogs at Quilting Jet Girl, and her blog logo looks so much like the rockets on this fabric that I knew I wanted to use it for her. Yvonne said that she prefers cool colours, though she also loves orange. It seemed only right to use the orange rocket. 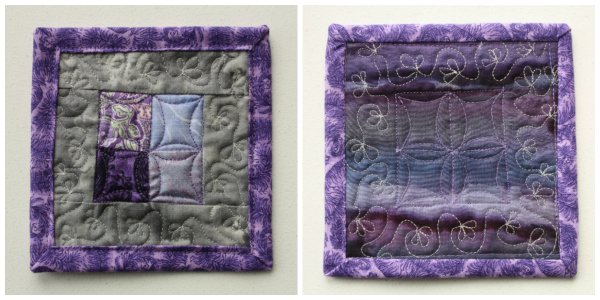 Yvonne and I mailed our mini mini quilts on the same day, so it will be interesting to see which way the mail moves faster. My last mini mini is this flower one. I started with the scrap of yellow floral fabric and just went from there. Even the quilting design was inspired by the fabric. This one is still available for swapping too. If you're on Instagram, have you been caught up in the Mini Mini swapping too? It's so fun and satisfying to make a complete quilt so quickly! Now, that I've indulged in that bit of fun, I better get back to the things I'm supposed to be doing, though! I have a new little guy that I'm babysitting this school year and he's having a tough time adjusting to being away from his mom. Thankfully, the past few days have been better, but for awhile the early part of the morning was really rough. The first couple of mornings I tried distracting him by playing videos of Sesame Street song on my laptop. It worked a little, but wasn't great, so we gave it up after a few mornings. Nathan, though, really enjoyed those little videos while he was eating his breakfast. He even picked a favourite song pretty quickly. It was the Raise Your Hand song, which is all about the importance of raising your hand when you have something to say at school. I have to admit, it was one of my favourites too! After only a couple of mornings listening to it, I'd hear Nathan going around the house in the afternoon singing, "Raise it up, raise it up, raise it up." Isn't it funny how quickly songs can get stuck in your head? Sometimes it's fun, like when you're able to spend your day 'hearing' your new favourite song even when there's no music around. Other times it's less fun, like when it's a song you really hate, but it's stuck in your head anyway. Kids' songs, because they tend to be especially upbeat and repetitive, can really get stuck in my head quickly. Psalm 119:11 says, "I have hidden your word in my heart that I might not sin against you." That's like saying to God, "Your word is stuck in my head, I hear it all the time, so I won't do the wrong thing." The best example of this is Jesus, who resisted temptation from Satan using the words, "It is written," (Matthew 4:4,7,10) followed by verses of Scripture. Jesus knew the Scriptures and could easily bring to mind ones that would help Him with specific temptations. If you're anything like me, you have snippets of lots of different verses in your head, and you can call them to mind fairly readily. The question is, do we listen to those verses when they run through our minds? When we have a bit of gossip we want to share, do we listen to the little voice in our head that says, "Without wood a fire goes out; without a gossip a quarrel dies down" (Proverbs 26:20)? Or, when we have to do a task we really don't want to do, and we're tempted to do just enough work to get by, do we listen to ourselves thinking, "Whatever you do, work at it with all your heart, as working for the Lord, not for human masters, since you know that you will receive an inheritance from the Lord as a reward. It is the Lord Christ you are serving" (Colossians 3:23,24)? Knowing Bible verses is great, but it's not all the useful unless we also act on what we know. Jesus said to Satan, "It is written: ‘Man shall not live on bread alone, but on every word that comes from the mouth of God.’" (Matthew 4:4). That statement was His refusal to turn rocks into bread to prove that He was the Son of God. If Jesus had thought about the Scripture, then turned the rocks into bread anyway, it really wouldn't have helped Him much to know the verse, would it? Likewise, it really doesn't help us when we know a verse, but then go against it anyway. It's a wonderful practice to memorize Bible verses. Having them stuck in your head, or hidden in your heart, as the psalmist put it, is the first step. But then, in order to live according to God's word, you have to actually use what you know.